Chaotic shapeshifters Daughters need little introduction. From their earliest bursts of dizzying sound to the more tempered yet haunting songs that have been released from the upcoming album, You Won’t Get What You Want, the band has been a focal point in the extreme underground even during their hiatus. Their uniquely fearsome take on noise rock places them outside of expected tropes of idolizing mid–90s legends, instead showing a fearlessness and experimentation that keeps audiences uneasy and unable to anticipate future twists. As lovers of terrifying innovation, Roadburn is absolutely thrilled to welcome Daughters to the 2019 roster. We anticipate lurching horror and bombastic heft to keep the room in constant tension as they deliver the intensity they’re known for. What we know for certain is that fans of everything from The Locust to The Birthday Party will find a little something in this performance, which is bound to leave the room sweaty and exhausted. “Partaking in Roadburn is similar to what I expect it’s like to be involved in a Scorsese film; performing is a close second only to the opportunity to work with an array of talented artists. We are grateful to be included” – Alexis Marshall. 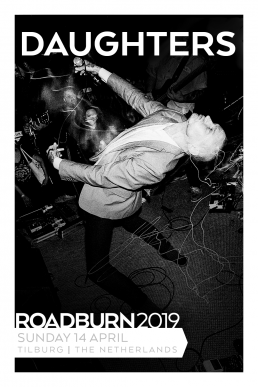 We hope you’ll join us as Daughters ruin the room at Roadburn 2019 on Sunday, April 14.